Tengyuan Liang works on problems at the intersection of statistical inference, machine learning & optimization. His main research focuses on the mathematical and algorithmic aspects of inference and learning under computational budgets, especially for large-scale datasets. Specific topics include: computational difficulty and efficiency in statistical inference, statistical learning theory, and high-dimensional statistics. He is also interested in network science, online learning, stochastic optimization, and applied probability. His research has been published in top statistics journals, as well as in leading peer-reviewed machine learning conferences. Outside of academia, Liang has experience as a research scientist at Yahoo! Research at New York in 2016, collaborating on large-scale machine learning problems with industrial applications. 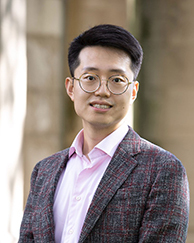 Liang earned a PhD in statistics from the Wharton School at University of Pennsylvania in 2017, and a BS in mathematics and applied mathematics from Peking University in China in 2012. He joined the Chicago Booth faculty in 2017.